Happy Wednesday! On this first Wednesday of August, I just want to address two things. First of all, sleeveless button-down tops are THE BEST. Collared shirts pretty much make any outfit more "work appropriate," but one without sleeves is so much easier to layer. Especially during hot, Oklahoma summers (we finally hit 100 degrees... ugh). I recently bought this floral sleeveless top and I'm eying this option and this option. Secondly, I just want to say THANK YOU. I don't think I've ever properly thanked all you wonderful people for reading my blog, for following me on Facebook, for sharing your thoughts via comments and emails and just for generally supporting me. 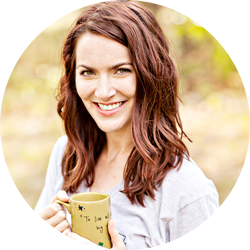 I still don't really know what this blog is about, but I do know that blogging is my favorite hobby. I'm feeling super sappy today so I just needed to pass it along! I adore the color and pattern mix of this look and I love that your dog gets to make an appearance. If I could get my little monster face (my dog child) to hold still for two seconds, he'd be a great accessory to my posts. The picture with Winston just made my day - he's adorable! Love this look Ashley! You are sparkling! That skirt with the blouse is just gorgeous! And hello little furry friend! this is very cute. The patterns mixed beautifully! in LOVE with this outfit.. and that dog. So lovely! You are a beauty, love. What a great outfit!! I love stripes and floral...and a great color combo! Cute outfit. 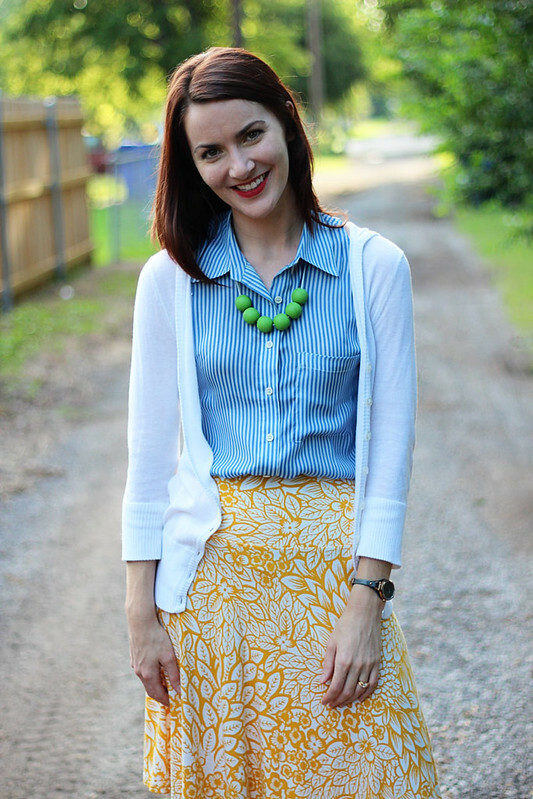 I love the yellow skirt and it looks great paired with your striped blue top! Love the outfit! Would never think of pairing a blue stripe shirt and a yellow floral skirt, but you have done it so well :) And your dog is just so adorable. What breed is it? Thanks so much Supria! He's a goldendoodle. I'm such a huge fan of sleeveless button downs! They are perfect all year long! And I love the mix of colors and prints! Love the dog! I want to snuggle up to it! Ashley, you've got the most adorable style! And this outfit is so feminine and fresh. 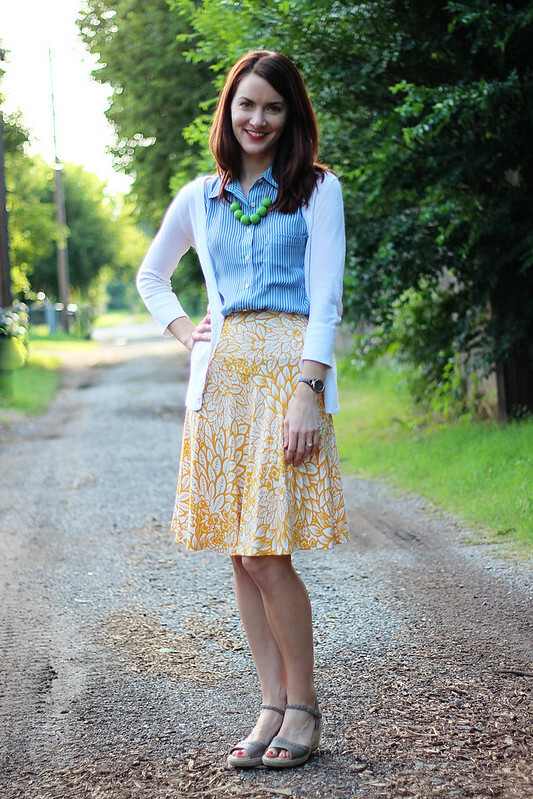 Love the floral yellow skirt with the striped sleeveless shirt. And yes, sleeveless collared shirts are great layering pieces. The pattern mixing is too cute! I live in sleeveless blouses in the summer too...they are great for work and for the weekends! 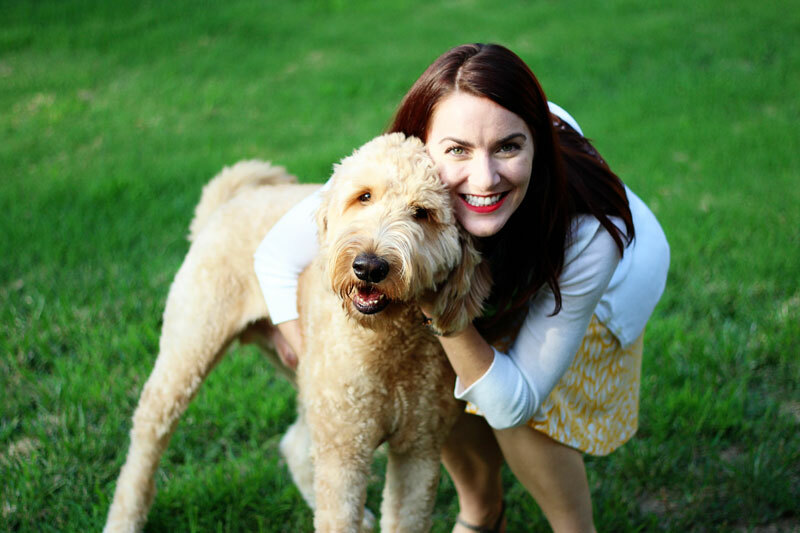 Love the photo with your doggy...adorable!! Too funny - yellow skirt & yellow dog!!! But your dog does mic in perfectly!!! And I love that shirt - I wouldn't have known it was sleeveless w/o close inspection or reading your post and agree that they are great for sweltering summers. The stripes and patterned skirt look amazing together. Love the whole outfit, but want to steal the dog, haha!! I love your yellow skirt and pinstriped shirt! Super cute preppy outfit! ah, you are a doll! i adore your whole outfit here, and i love the big beaded necklace! That skirt is cute! And awesome idea about the button shirts! You're so right about layering. Very cute outfit! Love the striped top with the floral skirt! And that necklace is a nice touch! 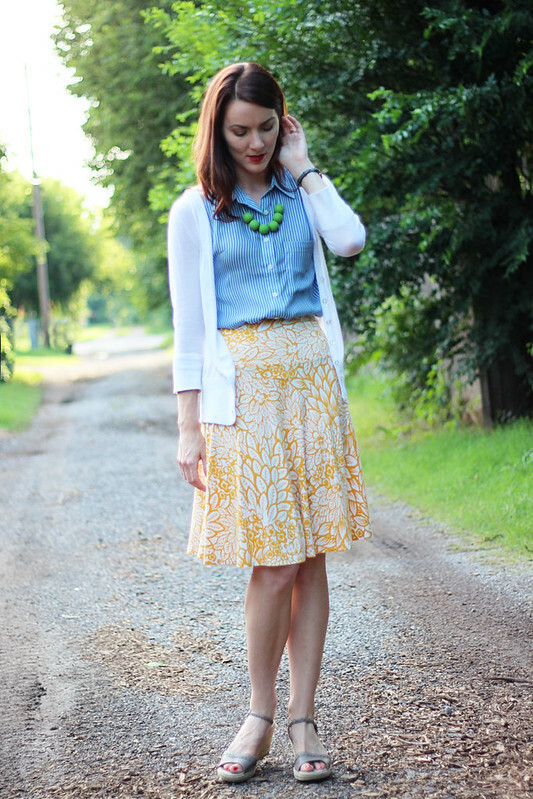 That Yellow Skirt is Darling. Looks Great with the Stripped Button-Down. 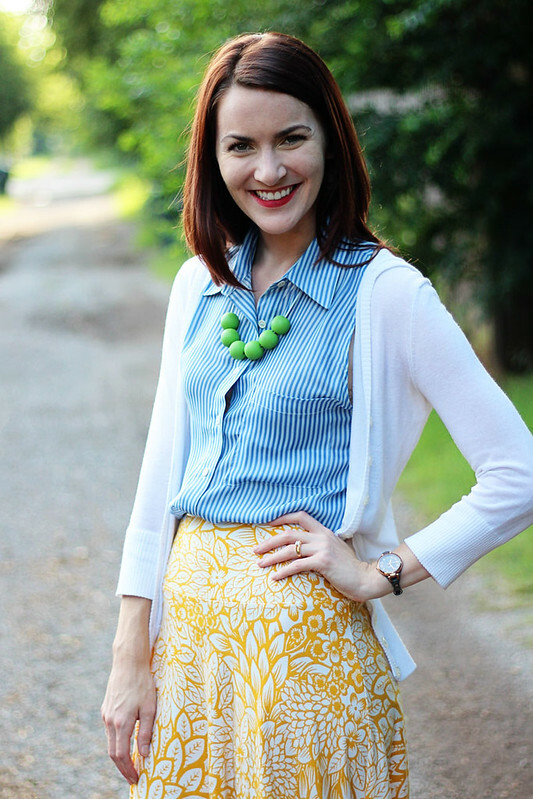 I agree: Sleeveless Button-downs are so cute & versatile. BTW, this Skirt is a Flirty Skirt for sure.